Abstract: The Internal Coherence Framework presents a system of research-based practices for assessing and developing the conditions that support adult and student learning in schools. Internal coherence is defined as the ability of educators in a school or system to connect and align resources to carry out an improvement strategy, engage in collective learning, and use that learning to provide students with richer educational opportunities. 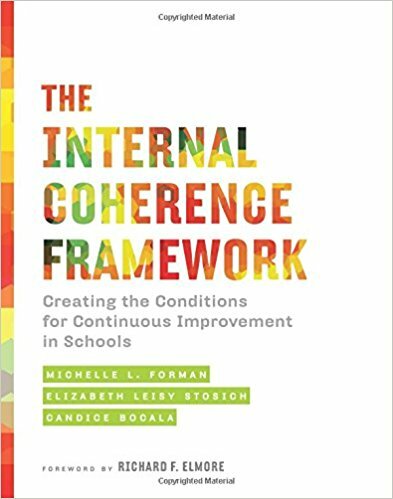 The internal coherence framework featured in the book brings together three important domains of research: leadership for learning, organizational improvement, and instructional efficacy. School or system leaders who progress through this book with colleagues will develop a shared vision for ambitious teaching and learning anchored in the instructional core; organize the work of the leadership and teacher teams to advance this vision; and build psychologically safe team, school, and system cultures to support the risk taking and constructive challenges necessary to move schools or systems to the next level of performance. At the heart of the book is a survey and rubric that can help schools better understand their strengths and weaknesses and the kinds of resources they need to support student learning. The book blends theory and practice to bring tested wisdom to bear on critical issues of education leadership and professional learning.